Javier Bardem, Penélope Cruz, Peter Sarsgaard et al. 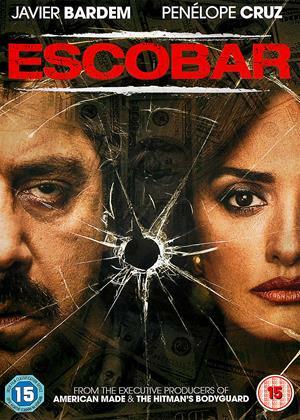 Starring Academy Award Winner Javier Bardem and Academy Award Winner Penelope Cruz, with Peter Sarsgaard, 'Escobar' chronicles the life of the most notorious drug kingpin in history, during the years of his sensational and scandalous love affair with Colombia's leading TV anchor, Virginia Vallejo. A feared and fearless criminal who amassed a fortune in excess of $20billion and is said to have been responsible for the deaths of more than 3,000 people, Escobar's reign of terror was infamous, and tore his beloved Columbia apart. Twenty years in the making, Escobar offers a fresh and unique take on a criminal who was cruel and charismatic in equal measure. Exploring his infatuation with Vallejo, it journeys deeper into the legend of 'The King of Cocaine' than ever before, telling of his astonishing rise, and ultimately, his tragic fall. So bardem thinks he can do a brando by talking like he's got cotton wool in his mouth. I caught every other 8th word. Either that or the dvd was out of whack. I think the former as stupidly the film subtitled the Spanish swearing immediately switching back to unintelligible English once the swearing had ended. Now to the positives. Why should you watch this film? Why should you watch any film? Because it stars penelope cruz. Frankly I would watch PC if it was a film about paint drying. Her only blemish for me is vicky Christina Barcelona.. But I'll forgive anyone a mistake. So although I've given 2 stars.. Watch it and maybe you'll make sense of it dialogue wise.